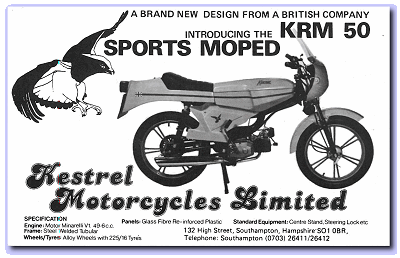 1980 and the Kestrel motorped is advertised as built in Southampton at a crazy price of 660 quid. Based on a AJW Fox, redesigned with a frame by the Italian form LEM and using a Minarelli engine, the Kestrel soon sank without trace. Hampton produced motorcycles from 1912 to 1914 in King’s Norton, Worcestershire. In 1912 The company made a single-cylinder model with a 3½ hp Hampton engine, Saxon forks and belt drive. In 1913 They added a 2½ hp model, with either fixed or free gear, or a three-speed hub. In 1914 Machines were fitted with 3½ hp TDC engines. TDC or T. D. Cross and Sons was founded in 1870 in Birmingham, producing bicycle components. They expanded into production of roller chain sprockets and gearing. TDC produced motorcycles between 1914 and 1915. They made machines with 3½ hp own-brand and Precision four-stroke engines. In 1915 they produced a two-stroke with their own design engine. All were sold under the TDC brand name. TDC engines were fitted to the Lily motorcycle, Eyme, Runwell, Hampton, Maxim of Coventry, Wolf, Witall, the Westovian by R. V. Heath, and also the Perfect. The virtual encyclopaedia of motorcycles? The virtual Tragatsch? The virtual museum of motorcycles? This is just an honest attempt at a listing of all motorcycles to share with all motorcyclists. If you know of any that should be included please drop me a line and if you have any photos of any brand that could be used to complete the index please send them to me, thanks. Going strong since 1996 but as site gets older so do I and updates take longer. Such is life!